The 1/3 mile course is close to what we race here in Europe (NAVIGA). The 1/4-mile course is crazy tight...! The picture above is borrowed at the old International Waters gallery. 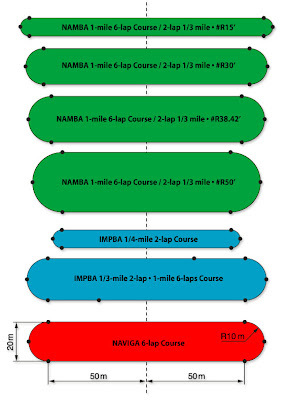 Here below you can see an overview picture of the basic sizes of the diferent NAVIGA, NAMBA & IMPBA oval courses. The one Kently set his new records at is the blue ones.